Here is the first set of cards that I designed for UStamp With Dawn and Friends...Cards with Cool Moves 2010! It was featured a few days ago on the UStamp Site. If you would like step by step directions with pictures on how to make both cards, please go to the UStamp Site here http://ustampwithdawnandfriends.com/ to register. There will be a total of 40 sets of moving cards for you to enjoy plus live chats and prize giveaways! So much fun! I love how bright and cheerful this is. Looks fantastic! Love the colours. Love your choice of colors. Now following from Stampin' Connection. Fabulous cards - the colors are pretty and the design is great! I am now following you from SC. I'm now following you from SC - I'm also a member of the UStamp and love your cards for the Cool Moves event! Thanks for sharing! 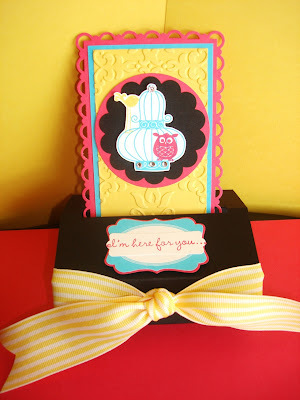 I cased your card on my blog http://traciscraftbookers.blogspot.com. It will post on January 7th.